The trading of cryptocurrency is similar to that of Forex in that you are exchanging one type of currency for another. While you could in theory use Forex trading fundamentals to enter the cryptocurrency market, there are some notable differences that need to be thoroughly understood in order to ensure your success. These variances can be found in the size, structure, and behaviour of the two markets. With the above in mind, how do you determine your optimal investment market? Before a decision can be reached, you need to study the similarities and differences between the two opportunities to find the one best suited to your personal circumstances and investment goals. Those new to cryptocurrency often wonder what exactly it is and how it works. Simply explained, cryptocurrency is a decentralised, digital form of currency that is available worldwide and accessible via the internet. The first (and most successful) cryptocurrency was Bitcoin, created in 2009 by Satoshi Nakamoto. Other popular cryptocurrencies include Ethereum, Litecoin, Bitcoin Cash, Dogecoin, and Ripple, amongst scores of others. Although there are thousands of cryptocurrencies, the ones available for trade differ between exchanges. In light of this, it is advisable to research which exchange supports the cryptocurrencies you are interested in, before signing up to trade. Forex trading was inspired by the 19th century practice of valuing a currency in relation to gold. Now having become the world’s largest marketplace, Forex is a traditional starting point for many investors looking to profit off exchange rates and currency market fluctuations, as the practice essentially comprises betting on future market movements. A standard trading pair involves two fiat currencies, such as USD or GBP, and wagers on their value against one another. A trader may postulate that the GBP, for example, will gain in relative value within a chosen timeframe, basing his assumptions on trading software and/or current newsworthy events. Both trading marketplaces consist of several and varied platforms, each with their own advantages. It is important to do due diligence on the platforms of choice before commencing trading, to ensure that they are indeed best suited to your needs. Forex and cryptocurrency platforms are both highly accessible, yet cryptocurrency slightly more so – offering full functionality around the clock. Forex markets are available only on weekdays, with limited or zero accessibility over weekends, depending on the nature of desired trades. Once the recommended industry research has been conducted, it is surprisingly easy to get started with cryptocurrency trading. Traders typically require no more than a small amount of capital and access to one or more cryptocurrency exchanges to begin. While many insist on users completing KYC protocols, certain exchanges are more lenient, and it is advisable to check all trading requirements in advance. Degrees of interaction between cryptocurrency and fiat currencies differ between platforms, with some offering full interoperability and others none at all. Crypto-to-fiat (and vice versa) exchanges may accept debit or credit cards and bank transfers, while crypto-only exchanges offer no support for fiat currencies. Some exchanges exist which offer both. Forex and cryptocurrency trades are usually executed with immediate effect, minimising price slippage to a negligible amount should it occur. In rare cases, trades can be delayed by a computer or software glitch – however, no technology is immune to errors of this nature. An advantage of a centralised currency is uniform demand. The government controls the currency, and with it, bestows its value. Cryptocurrency is entirely different, as its demand is determined and influenced by its utility, public adoption, marketplace emergence, and its perceived and hopefully retained value. Devoid of these factors, cryptocurrency loses its place in the market. Forex has one other obvious advantage in the form of its market size, with global trades exceeding USD 5 trillion per day. This lends it the liquidity, depth and stability that largely contribute to the public’s trust in the marketplace. Where Forex offers considerable leverage on trades, cryptocurrency offers little to none. Forex traders making use of leverage spanning 50 to 500 times their initial investment are able to increase profits substantially, without increasing capital put in. This trading style does, however, carry a huge risk, as trades gone bad often carry a large financial liability. Forex trading platforms profit from trades by increasing the range between the bid and the ask price, and retaining the difference. These sites seldom work with independent commission-charging middlemen, and trades are facilitated directly by investors. Cryptocurrency exchanges profit from transaction fees added to each trade, and rates vary greatly between trading platforms. A portion of the fees are not owned by the exchange but by the cryptocurrency itself, which often utilises a self-sustaining blockchain to compensate miners for their contribution. Bitcoin is one such example. While fiat currencies are government issued and thus regulated, cryptocurrencies exist independent of any governing authority. As a result, fiat currencies are heavily influenced by monetary inflation linked to government actions, whereas cryptocurrencies are influenced by the actions of those using it, and their response to news and noteworthy events. Inflation in cryptocurrencies is sometimes managed by algorithms written into their code which automatically decrease their value as stock in the marketplace rises. As the price of cryptocurrency and fiat currency are controlled by different factors, their respective volatility and predictability are on opposite ends of the spectrum. Average volatility in the Forex space ranges from 0.5 to 1 percent, whereas cryptocurrency can have volatility of 15 percent - and in some cases, even more. With cryptocurrency’s potential for substantial profits comes the risk of crippling losses. This both repels risk-averse traders while attracting risk-taking investors. Regardless of trading style, it remains vitally important that extensive research is conducted before a novice trader adds cryptocurrency to his investment portfolio. 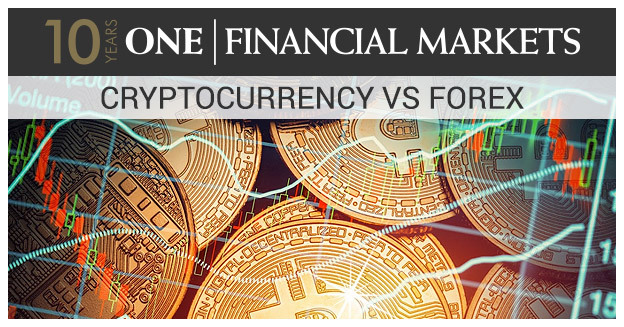 Forex and cryptocurrency trading can be seen as cousins, similar enough to be compared yet vastly different in terms of actual use and application. While Forex is sometimes considered a short-term investment, cryptocurrency is a long-term one that requires endless patience and nerves of steel. It is impossible to tell whether the risk taken will pay off in the end. Added to the complexity of cryptocurrency is the number of new digital currencies created each month. This may create confusion and frustration for some, as it becomes increasingly difficult to predict which ones will be successful. Still not a deterrent to the experienced and adventurous investor, many have seen profits while others have cashed out their portfolios and migrated to calmer seas. The best recommendation given to those at a loss as to whether to invest in Forex, cryptocurrency or both, is to hold a diversified portfolio split in proportion to their appetite for risk, investment objectives, and disposable capital at hand.